Here are a variety of fully designed intergenerational programs. Use the links below to go the LifelongFaith website where these sessions are found. how other generations think and what drives them spiritually, ministers and congregation scan not only avoid conflict, but also put those distinctions to work in order to minister more effectively and create harmony in our religious communities. The book provides a lucid analysis of how beliefs, expectations and experience differ from one generationto the next, and clear-cut, practical and specific advice about how to use that analysis to facilitate communication, congregational harmony and spiritual direction. 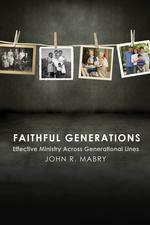 As a new generation of children emerges and the older adult population enters a period of explosive growth, it is time to turn our attention to how churches can effectively be in ministry across the generations.Gen2Gen: Sharing Jesus Across the Generations is a collection of articles about the newest trends and issues that are impacting individuals, families, churches, and communities. Develop by the staff at the General Board of Discipleship of the United Methodist Church, Gen2Gen will challenge you to create ministries that connect with the youngest and the oldest members of our society. The essays in the book are organized into the following categories: 1) Who Are We?, 2) Technology and the Church, 3) The Multi-World: Multi-ethnic/Multi-Cultural Aspects of Ministry in the 21st Century; and 4) The Multi-Generational Family.